Earlier this week, Pennsylvanians woke up to backyards full of curious snow formations. The hollow cylinders varied in shape and size from doughnuts to hay bales to rolled-up carpet. They are snow rollers, making their first appearance in Pennsylvania in 10 years. If you've ever made a snowman, you pretty much know how this works, except, of course, no human hands are involved. Strong winds snag on a bit of snow and push it along the ground, where it gradually picks up more and more layers of snow. Snow rollers require just the right combination of light, sticky snow and blustery winds. Snow rolling like a wheel downhill can form such shapes, too. 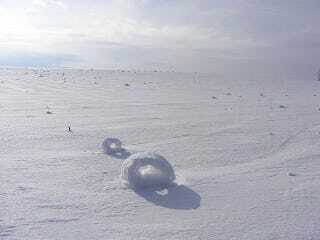 These are snow rollers below appeared in Washington state. I live in California now, and while there is much to recommend about the weather here, I miss how winter can transform the landscape into something entirely otherworldly.